By John C. Toman. Posted November 25, 2011, 11:02 AM. A Thanksgiving Day storm passed by with no measurable rainfall in Southern California's inland valleys, and weather has quickly transformed to sunny skies today. High pressure aloft and surface high pressure to the east are in the process of setting up, and should deliver a few days of warm, dry weather, for the weekend and into early next week. There was no measurable rainfall at any of WeatherCurrents' 16 stations on Thursday. Friday will be a transitional day, in terms of temperatures, but afternoon generally in the lower to middle 80's are predicted for Saturday and Sunday, and should last into next week. The exceptions to this will be in the San Jacinto Valley, and in the San Gorgonio pass area, where temperatures will be in the middle to upper 70's. 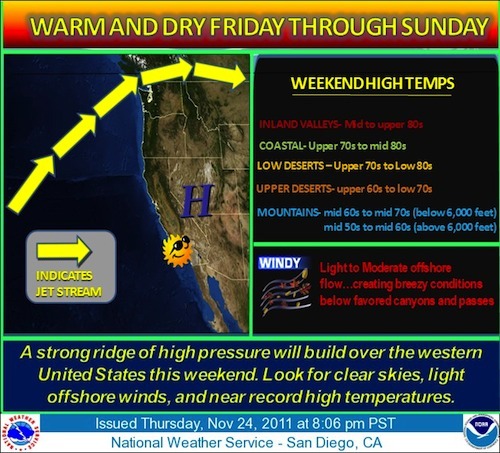 Wind gusts are expected to kick up Friday night, and periods of offshore winds are possible through Sunday, mainly in the northern areas, and below the passes and canyons. The windiest locations could see gusts in the 45-50 mph range. After Sunday, offshore winds look to be less prevalent, but may return in weaker forms Monday and Tuesday. The weather models are divergent for the latter part of next week. High pressure will be breaking down, and it will be cooler. Whether or not we get any rain is still up in the air.